Happy Friday! We are so excited to kick off this weekend for several reasons: 1.) It marks the start of our Spring Break vacation, and 2.) We have a fun new shop and surprise in store for you! Being true southern ladies, there is nothing we enjoy more than a good monogram. Living in the south it's pretty much our birthright to have our name or initials proudly displayed on just about every object we own - and we love it! We are always on the hunt for fun and unique monogrammed pieces to incorporate into our wardrobe, and recently we were introduced to this darling little shop - The Pink Monogram. As we browsed through the shop, our southern style hearts were swooning over all of the fabulous preppy fashion and monogrammable items available. With another sweet baby entering my world, I've had to stow away a large portion of my earrings and necklaces to keep them safely out of the grasp of those tiny, but dangerous hands. The Pink Monogram has a fabulous selection of personalized earrings, and I decided to try out a pair. I wanted something that would stay out of the reach of curious little fingers, but that also would still allow me to feel as though I was on trend in the accessories department, and the Monogrammed 18k Gold Plated Studs seemed like they were the perfect fit. I was simply smitten when my new earrings arrived. 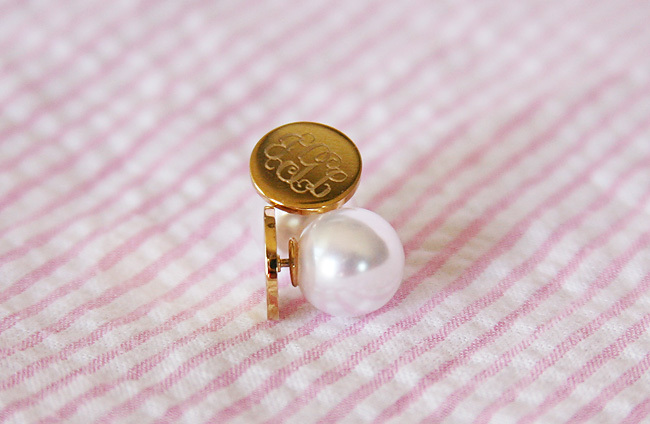 The monogrammed gold studs were just the delicate, yet trendy, touch I was looking for in a day to day earring. The pearl back is unique and gives an already gorgeous gold stud a little bit extra "wow" factor. 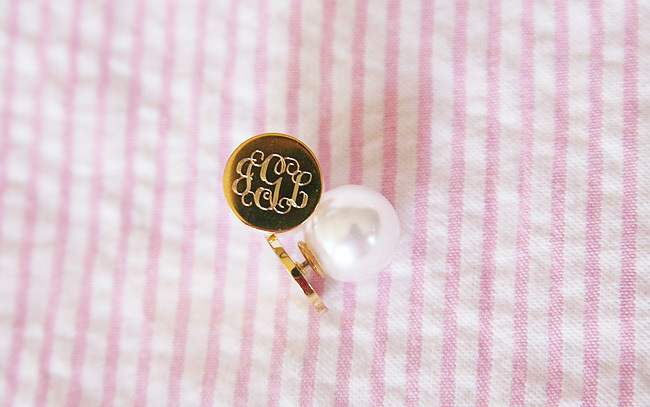 If there is one thing southern ladies might love more than their monograms, it would be pearls. Combine the two and you just might have our hearts forever. I've given the studs a good test run, and have worn them almost daily - both dressed up and dressed down. I've been very impressed with the quality of the earrings, and have received tons of compliments on them. I already can't wait to place another order with The Pink Monogram, and already have my eye on a few fun things - like this adorable sailboat shift dress. Or these fun needlepoint anchor themed ballet flats. Actually, any of their needlepoint flats please - they are SO cute! They have a little something for everyone, covering everything from fashion for the whole family, tailgate gear, rainy day accessories, and even home decor - I am in love with these pillows! 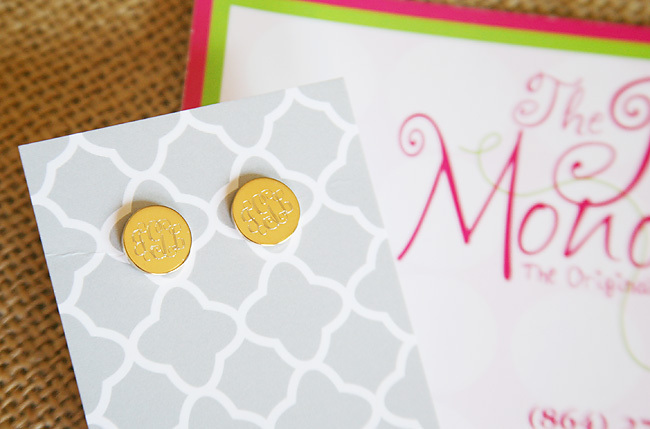 And just one more reason to love The Pink Monogram, they have decided to help share in our fun over finding their boutique by giving one of our fabulous readers a set of Monogrammed 18k Gold Studs. 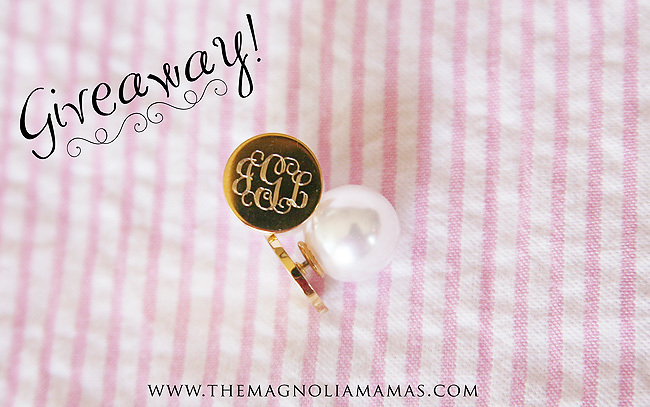 To enter, just leave a comment below letting us know what your favorite item from The Pink Monogram is. Also check below for additional entry options. A winner will be announced next Friday, April 8th. To enter the giveaway you must be a U.S. resident 18 years or older. Winner must contact us within 48 hours of announcement or a new winner will be chosen. What is your favorite item from The Pink Monogram? I've never heard of this company, but their website is great! So many options. I like the burlap clutch. Very cute! I like the Clutch it would be handy to carry around. These earrings look great. I love the monogrammed weekend tote bag and have loved the Pink Monogram shop for a while now! Tracey M: I love the pillows. May have to get a couple. I love these earrings!! The pearls definitely give it a little extra sass! :) I love their palm beach monogram sandals- so cute!! 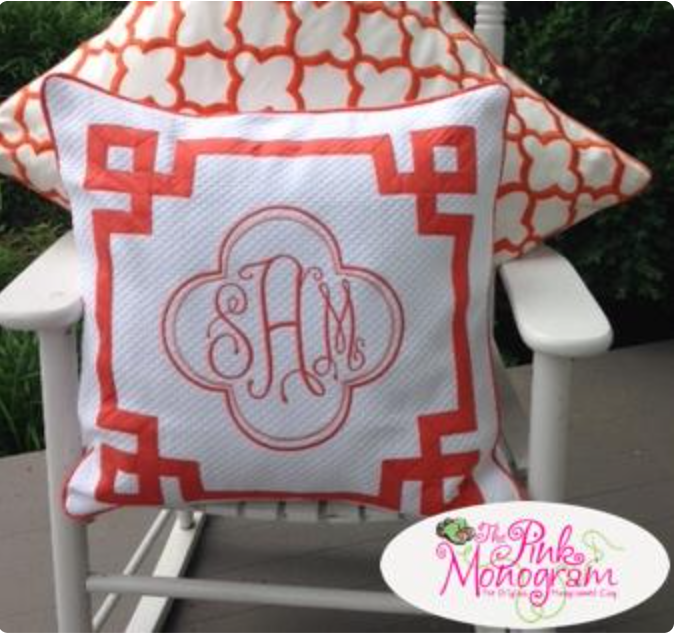 Love the monogrammed pillows!! These earrings are sooo pretty!!!!! I like the Good Girls Gone Plaid Monogrammed Bangle Bracelet. I love the Anchor Canvas Tote! Beautiful colors and such fun choices. I love the Kimono Wrap robe!! I'd love the Monogrammed Shower Curtain From Jane Wilner Designs for my master bathroom. Monogrammed Cairo Robe From Matouk would make a nice wedding gift. I really adore the cutting board, such a great idea! Especially the 10x16" rectangular walnut cutting board. Well so many cute things...but really anything with an anchor on it...like those anchors flats! I love the Chain Stitched Single Letter Pillow. I love the engraved cuff bracelets! I like the monogrammed weekender with hot pink trim. Great classic style with a fun burst of color! I love the Monogrammed Single Initial Sterling Silver Rococo Necklace. I love the anchor flats-so preppy and perfect for the upcoming Summer. I would like the Matouk Guesthouse Cotton Bath Rug. I would pick the seagrass color. Wow these are so nice! I like monograms they make getting married such a nice exciting gift too. So many fun things! Love the Florida Basket purse! I love the anchor flats! I really like the monogram necklaces.